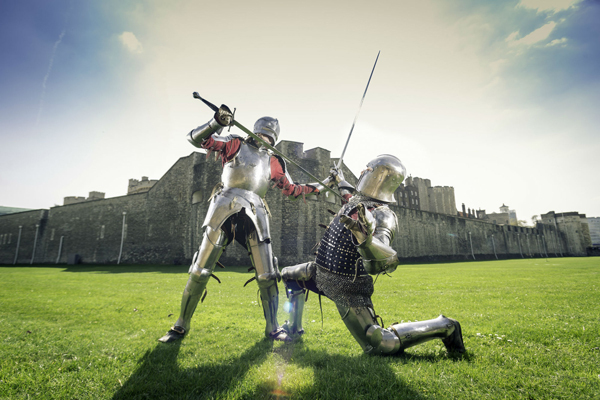 • The Tower of London’s dry moat will be transformed into a 15th century medieval court gathered to welcome a new Queen, Margaret of Anjou, for the May bank holiday this long weekend. The world of 1445 is being reimagined in a series of festivities – under the banner of Go Medieval at the Tower – which will include sword-fighting knights, hands-on experiences for kids such as the chance to fire a real crossbow, the “scents, sights and sounds” of a medieval encampment, and the chance to witness trades such as armoury and coin-striking. As well as, of course, opportunities to meet King Henry VI and his 15-year-old queen, Margaret who, upon her coronation, was honoured with a lavish pageant from Westminster Abbey to the Tower in which she received extravagant gifts including a lion. Runs from 10am to 5pm from Saturday to Monday. Admission charge applies. For more, see www.hrp.org.uk/tower-of-london/. PICTURE: © Historic Royal Palaces. • Working Londoners from the past 500 years are the subject of an open air exhibition opening in Guildhall Yard on Saturday. Londoners: Portraits of a Working City, 1447 to 1980 features a range of photographs, prints and drawings – many displayed for the first time – from the London Metropolitan Archives. The exhibition – which includes images of Jack Black of Battersea, Queen Victoria’s rat-catcher, and Charles Rouse, believed to be the last nightwatchman in 19th century London as well as pictures of Savoy Hotel page boys, a brick dust seller, a farrier in 1980s Deptford and a 15th century Lord Mayor – complements The Londoners exhibition currently running at the LMA in Clerkenwell which features 50 portraits not included in the Guildhall display. The free outdoor exhibition can be seen into 23rd May – for more, see www.cityoflondon.gov.uk/thelondoners. The Clerkenwell display can be seen until 5th July – for more, follow this link. • The life of the butler will be up for examination at Apsley House, home of the Duke of Wellington, this long weekend in an event which will also see the duke’s Prussian Dinner Service laid out in all its glory. Butlers and Banquets will feature talks about the history of the service – commissioned by King Frederick William III of Prussia and presented as a gift to the 1st Duke of Wellington after his victory over Napoleon at the Battle of Waterloo in 1815 – with younger visitors also having the chance to meet the butler of the house and find out what running a grand home like Apsley House was like as well as learning skills such as how to lay a table. Runs between 11am and 4pm from Saturday to Monday. Admission charge applies. For more, see www.english-heritage.org.uk/apsley. • A new exhibition marking the 100th anniversary of the Russian Revolution opens at the British Library in King’s Cross on Friday. Russian Revolution: Hope, Tragedy, Myths tells how the revolution unfolded during the reign of the last tsar, exploring the growth of the revolutionary movements with a special focus on key figures such as Tsar Nicholas II and revolutionary leaders such as Vladimir Lenin. Among the items on display is a letter Lenin wrote in April, 1902, applying to become a reader at the British Museum Library which he signed with his pseudonym, Jacob Richter, to evade the tsarist police. Other items on display include a souvenir album of the Tsar’s coronation and wallpaper hand-painted by women factory workers propaganda along with posters, letters, photographs, banners, weapons, uniform items, recordings and films. Runs until 29th August. Admission charge applies. For more, follow this link.